My last message, although quite serious in content, was tongue and cheek in its delivery to you. Although, whose to say that particular post even crossed your radar. I do hope that this blog post finds its way to you and or your representatives, because it is of a more serious nature. I am a homeowner, I live in small town Canada. I don't say rural, because that conjures up visions of wide open fields partitioned by wood line sectioned by the grid work of county roads. That's not the case where I live, there is a community of people, and although we don't have a McDonalds or a Wal-mart, we do have many small business's that make up the average small town; Petro-Canada Gas Station, Home Hardware and of course a Tim Hortons. The other thing we have here in my small town is a rail line. My first house here, was approximately two kilometers from where we built our new house and in the backyard, not 20 feet from the rear of our property line was a train track. Before I bought the house I inquired around town about how active the line was and the collective response was: "Hardly used at all." So, my wife and I jumped in and purchased the house; our first by the way. 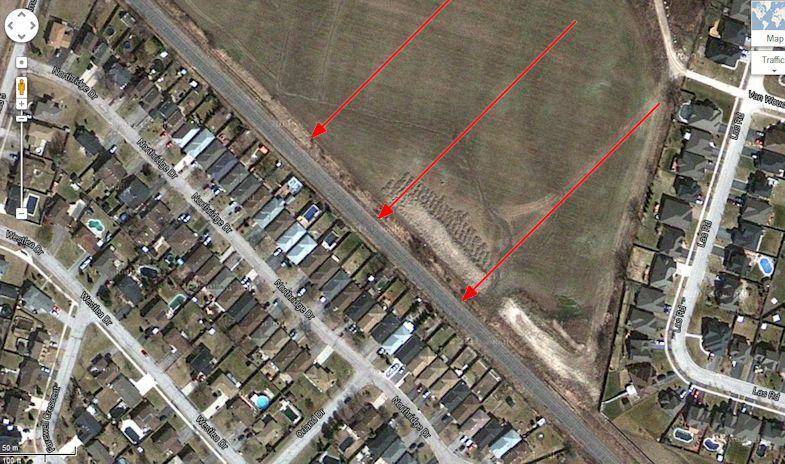 Above: Is a photo of my town and the red arrows point out the rail line running right past the backyards of residents. Now, I don't know if I was duped by the railway or if the entire town has conspired against us, but that rail line, the one that was hardly used at all, suddenly became very active. In fact, it became active at all hours and the engineers, (God love them), indiscriminately blew that air horn to let us know when they were coming through. Now, this didn't bother me all that much, having served 12 years in the Canadian Artillery, I'm half deaf and have an ability to sleep through almost anything; including fire missions behind 155 Howitzers. A train wouldn't stir me from my sleep. My wife on the hand; to say she is a light sleeper would be putting it mildly. My wife can hear a mosquito fart 15 kilometers away. If she were ever to attend a Metallica Concert, like it or not, they would be forced to turn the volume down to a whisper. So, every time a train would come through town and the steady "clack clack" of steel wheels on rail would be amplified through our bedroom window she would wake. One morning, around 3:00 Am, I felt a tug at my arm and when I rose from my stupor I joined her atthe back window where a very long train rolled eerily past. Under the cover of darkness it passed dream-like, only sixty feet from our small back-split home. No train horn this time, just a steady "clack clack clack". Behind the unseen locomotive, an endless parade of tanker cars, tar black and laden with dangerous good placards, passing one after another. I immediately recognized the placards, because as I've mentioned in my last blog post I am a truck driver. Strangely, you rarely saw these trains in the daytime, presumably because they would set off an alarm within the community. After watching this ghost-like presence moving like a chameleon in the night with its deadly cargo I decided that we would not be staying for very long at this new house. Over the course of the next year, I awakened on many nights and watched the window as my children slept thinking, "We have to move." Approximately a year and a half later we did just that, across town to a new place built away from the rail line, but that is only a visual distraction. Coincidentally, I move dangerous goods for a living and understand that a derailment of volatile chemicals would have far reaching effects. Last week I got a message from a friend of mine and he asked if I'd caught the news. I was just back from Alberta and hadn't focused much on the news. Too busy doing home stuff. When I went online to check the news I was astonished to see the Lac Megantic train wreck. I have two friends there, Marc and Rene, who are long timers in that sleepy little Quebec town. As you know, the death toll has been rising daily along with the despair and emotion that couples this preventable tragedy. My friends, Marc and Rene, were not among the casualties, but they certainly have been touched by this disaster. Lac Megantic is a community interwoven with friends and relatives. As rescue workers sift through the ashes, friends and family wait for the inevitable confirmation that those unaccounted for will be added to the growing list of victims. obvious that we have been poking the "proverbial bear " by pushing dangerous cargo through small town Canada. As a truck driver who regular moves dangerous cargo, I am surprised that the rail lines have not been forced to set up bypass routes. Now I know that this is not possible in all cases, but it seems that the environmental parties were all about rail a few years ago, especially if it meant getting trucks off the road and reducing our carbon footprint. While the idea of moving everything by rail does lesson greenhouse gas, the question now is really about regulating what gets shipped, where it gets shipped to and the route it takes. As a truck driver, I am restricted to dangerous goods routes. These were set in place to offset the unthinkable. If my truck, loaded up with Aviation Gas, or any other combustible is involved in an accident, the potential for loss of life is reduced significantly by using these routes. That's why we don't roll past schools or hospitals unless we are delivering to that local. Lessening the dangerous goods traffic, lessens the possibility of disastrous tragedy. Lac Megantic has presented us with a very dark lesson. If we are to move dangerous goods by rail, they must be moved with the safety of the general public in mind. Engineers and Conductors, must be well rested, procedures cannot be deviated from and most of all we should be reducing routes that run through small town Canada under the cover of darkness. Our rail infrastructure is in dire need of upgrade and I would go so far to say that if companies choose to ship on these routes they should be footing the costs for upgrades and bypasses that lessen the potential of disaster. So that's it Mr Prime Minister. I hope this blog from a simple Canadian living in small town Canada finds its way to you and or your Transport Minister. To the people of Lac Megantic, aside from my friends, I along with many other Canadians are watching in sadness as you deal with this terrible tragedy. Even without derailments, rail lines are highly toxic. Without free land which was once given to rail, relocation to bypass one town would be staggering. Here is an article you may find interesting and relevant. Last edited by petros; Jul 13th, 2013 at 11:46 AM..
Yeah, I don't see getting rail out of major cities like Regina or Toronto or even Edmonton. It is a major part of their infrastructure, but if we are going to ship volatile product, they, the rail system cannot be immune to more stringent safety regulations. and building bypasses should be a priority. Safety issues definitely need to be addressed. Had there been a conductor as well as an engineer to ensure safety redundancy, this wouldn't have happened. If cities can't afford relocation, there is no way in hell a small town could. How far away from a town is far enough for an anhydrous ammonia or chlorine spill? This shouldn't be the responsibility of small towns, it should be the responsibility of the Fed, the Railway and the Chemical Companies who utilize those lines. The entire country was built around rail. A two man crew minimum and speed limits make far more sense. That's a good start, but not the answer. Human error, was likely the cause in this case. Also, I don't know how Montreal Main works, but CN and CP have a 24/365 on call 2 hours notice to move requirement of all its conductors, as I found out when I was offered employment by both rail companies. I'm not sure what their Engineers contract is, but that's what is expected of Conductors. With that in mind, the potential for human error due to fatigue is an incredible risk. If we can regulate safe routes for trucks then we should be doing it for trains. Rome wasn't built in a day, but it has to start somewhere. Last edited by spaminator; Jan 24th, 2014 at 02:20 AM..
Too bad 47 people had to die first. The RR in question went broke, and has been sold. "They" "hope" there's enough money left over from the sale of assets to compensate families, yadda yadda yadda. more of the same and piled higher and deeper, and everyone from the owners to insurance companies scrambling like rats for a door marked Exit. Starting in November, tank cars like those involved in the deadly rail disaster in Lac-Mégantic, Que. will no longer be allowed to transport oil in Canada, Federal Transport Minister Marc Garneau says. The DOT-111 cars will be phased out for the carrying of oil six months earlier than planned for "non-jacketed" cars — those without a layer of thermal protection — and 16 months earlier than cars with jackets. Accident investigators have said for decades that the DOT-111 railcars are easily punctured or ruptured, even in low-speed impacts. By 2025, it will be prohibited to transport any flammable liquids in the cars, Garneau said. "The Lac-Mégantic tragedy reminds us of the importance of staying vigilant in order to ensure security while transporting dangerous goods across Canada," he said. Forty-seven people were killed when a train carrying oil exploded in Lac-Mégantic in July 2013. Garneau said he's visited the town a number of times following the disaster. "This was a profoundly traumatic experience for the town of Lac-Mégantic, and I really do want to help them move forward and rebuild, and part of that is rebuilding the confidence that municipalities need to have in their railway systems," he said. Once again, the Trudeau Liberals, with the help of the CBC and former astronaut Marc Garneau, now Canadian Minister of Transport, are picking at Canadian and American oil companies to make political brownie points in front of an unsuspecting public. Today, Transport Minister Garneau announced that present railroad equipment used to transport crude oil will be phased out starting November 01-16. The use of double walled cars will be then be compulsory. Garneau used the CBC to provide footage of the Lac Megantic rail disaster of July 06-2013 to justify the huge expense that is being bestowed upon Canadian National and Canadian Pacific Railways, along with other railroad companies. A move that is sure to increase the price of refined fuels greatly. While the massive fire, along with the deaths and injuries that followed have no doubt shaken the nation, one would have assumed that Garneau, a former naval commander and astronaut, would have had the respect and common sense not to use such an incident for political gain. Especially given the fact that negligence and not oil was the cause of the disaster. Negligence by employees of an American railroad entity. It’s a well known fact that faulty railroad equipment that had been left unattended for the night of July 06-13, and without proper braking equipment caused the runaway train, and not the cargo it was carrying. The train freewheeled 7 miles from Nantes, PQ to Lac Megantic, PQ, along a downward slope of 100 meters. When the freewheeling train arrived in Lac Megantique, it was traveling at speeds over 60 MPH. The derailment and subsequent pileup caused the tank cars, loaded with crude oil, to ignite. 47 people lost their lives. If a semi trailer unit loaded with watermelons and traveling along Highway 401 towards Toronto loses a wheel and crashes into another semi-trailer unit loaded with propane, causing an explosion, are the watermelons the cause of the disaster or was it not the loose wheel?? Of course trying to reason with Liberals is like trying to reason with watermelons. It just doesn’t work. anyway, we don't need no stickin' pipelines. rail the stuff. that's how we roll. Of course if the anti everything crowd had not been so busy opposing pipelines this disaster would never have happened. The same tankers will still roll carrying oil with far higher flash points. It's not CN or CP but privately owned companies like PROCOR and UTLX that own them. It won't cost them anything either. Obama subsidized 60,000 new tankers all while fighting XL. 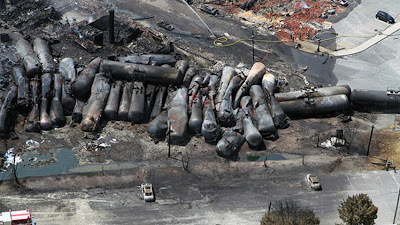 MONTREAL — Canadian Pacific Railway is directly responsible for damages caused when a runaway train carrying crude oil derailed in 2013 in Lac-Megantic, according to new allegations recently filed in court by the Quebec government. “Due to its agreement with the shipper, Canadian Pacific was, at all times, responsible for the crude oil from its point of initial possession until its delivery,” says Quebec’s amended lawsuit, which was filed Sept. 8. All the roughly 25 companies — except MMA — that paid into a $440-million fund received legal immunity from future prosecution related to the derailment. The sad thing is, the errors of these men is a symptom of a much bigger problem in the railway industry. Fatigue plays a role. Also outdated equipment. Train brakes should work like truck brakes and apply automatically when the air pressure drops. Setting brakes by hand is so 18th century. That is stupid even for you. How do you expect to get products required by industry from where they are made to where they are needed? Should we quit building roads and mining because explosives are required at the jobsite? Yes eventually energy east pipeline will be built . We will make the money up by having truckers sleep in hotels. have you not sobered up yet? SHERBROOKE, Que. 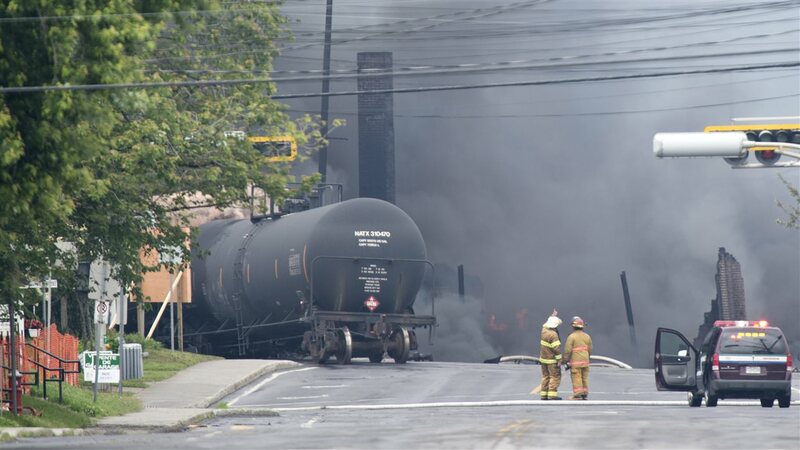 — A judge urged jurors at the Lac-Megantic trial to try once more to reach unanimous verdicts after they told him Tuesday they had come to an impasse on their sixth day of deliberations. But he nonetheless exhorted them to try again, and the eight men and four women will enter Day 7 of deliberations Wednesday. “The law gives me the power to dissolve the jury if it appears that holding you longer would be useless,” Dumas told jurors. “This power can’t be used lightly or prematurely. The jurors are deliberating the fate of Tom Harding, Richard Labrie and Jean Demaitre. The three were charged with criminal negligence causing the 2013 tragedy that killed 47 people when a runaway train carrying crude oil derailed and exploded in the small town. After Tuesday’s lunch break, Dumas convened the prosecution and the defence teams back into the courtroom and read a letter from the jury. The dictionary request was turned down. All three accused can be found guilty of criminal negligence causing the death of 47 people, while jurors have the option of convicting Harding on one of two other charges: dangerous operation of railway equipment or dangerous operation of railway equipment causing death. The three men each pleaded not guilty. Charles Shearson, one of Harding’s attorneys and the only lawyer who regularly speaks to reporters, said it is common for jurors to struggle to agree. “It’s not rare that juries come to an impasse,” he told reporters shortly after Dumas sent jurors back to deliberate. Before Dumas asked jurors to try again, he suggested to the legal teams that if the jury came back a second time without reaching unanimous verdicts on all three accused, he would ask the 12 if they could at least come to an agreement on one or two of the accused. None of the three men presented a defence at the trial, but lawyers for each told the jury, in turn, the Crown had failed to meet its burden of proof. The prosecution mounted a case that the three were each criminally negligent in their own way for failing to ensure the train was safe before the wee hours of July 6, 2013. That’s when the locomotive and its cargo of crude oil from the United States rolled away and derailed in Lac-Megantic, exploding and then killing the 47 people as well as destroying part of the downtown core. The Crown argued that Harding’s role was significant because he didn’t apply a sufficient number of brakes after parking the oil-laden convoy for the night in nearby Nantes. Harding applied only half the required level of brakes and didn’t test them to ensure they worked properly before leaving for the night. Shearson countered that the rail disaster was an accident resulting from a perfect storm of unforeseeable events. He said Harding admitted to not conducting a proper brake test and failing to apply a sufficient number of handbrakes, which would have prevented the train from moving after its engine was shut off. He suggested that evidence presented during the trial demonstrated the Montreal, Maine and Atlantic railway didn’t require its employees to perform brake tests perfectly in line with the federal regulations. “We can’t hold people criminally responsible for not being perfect,” Shearson told the court. And Harding could not have foreseen the locomotive catching fire after he left for the night, the lawyer added. Firefighters extinguished a blaze at the lead locomotive shortly before the tragedy and cut the engine, which meant the air brakes were not functioning. The prosecution also blamed Labrie and Demaitre, arguing their responsibilities included taking the necessary steps to avoid injuries and loss of life the night before the derailment. Lawyers for the Crown claimed neither man deemed it necessary to check with Harding to see how many handbrakes had been applied and whether tests had been conducted. Demaitre’s lawyer, Gaetan Bourassa, argued his client had no say in safety-related decisions made in the United States by Montreal, Maine and Atlantic’s parent company. Labrie’s lawyer, Guy Poupart, argued his client had a limited role in the tragedy. He also played up the testimony of several witnesses who described him as competent, reliable and someone they trusted. SHERBROOKE, Que. — One of the most closely watched Canadian trials in recent years ended Friday with the acquittal of three former railway employees who were charged with criminal negligence causing the death of 47 people in the Lac-Megantic tragedy. The jurors reached the verdict on their ninth day of deliberations. Tom Harding, Richard Labrie and Jean Demaitre were charged with criminal negligence in the 2013 tragedy that killed 47 people when a runaway train carrying crude oil derailed and exploded. A teary-eyed and emotional Labrie said he hopes the trial delivered the answers the 47 victims and Lac-Megantic residents were looking for. “Even though I never spoke, I always thought of you,” he said, his voice cracking. “I would like to say that Lac-Megantic residents, with what they had to go through, showed us a lot of courage and help and lots of resilience. Thomas Walsh, one of Harding’s lawyers, spoke to reporters on his client’s behalf after the verdict. “Mr. Harding is too moved by the situation to give a coherent expression of what he feels inside,” Walsh said. “You’ll understand it is not necessarily the decision we were expecting but we respect the verdicts that were handed down and, especially, the work the jurors put in,” Beauchamp said. All three accused could have been found guilty of criminal negligence causing death, while jurors had the option of convicting Harding on one of two other charges: dangerous operation of railway equipment or dangerous operation of railway equipment causing death. “I think it was more proper that there be some kind of a public inquiry to find out and determine all of the circumstances that led to this tragedy — and not just the role one or two people might have played,” Walsh added. That’s when the locomotive and its cargo of crude oil from the United States rolled away and derailed in Lac-Megantic, exploding and then killing 47 people as well as destroying part of the downtown core. The Crown argued that Harding’s role was a significant one because he didn’t apply a sufficient number of brakes after parking the oil-laden convoy for the night in nearby Nantes. Another of Harding’s lawyers countered that the rail disaster was an accident resulting from a perfect storm of unforeseeable events. “We can’t hold people criminally responsible for not being perfect,” Charles Shearson told the court. Shearson said Harding admitted to not conducting a proper brake test and failing to apply a sufficient number of handbrakes, which would have prevented the train from moving after its engine was shut off. He suggested that evidence presented during the trial demonstrated MMA didn’t require its employees to perform brake tests perfectly in line with the federal regulations. Demaitre’s lawyer, Gaetan Bourassa, argued his client had no say in safety-related decisions made in the United States by the parent company of Montreal, Maine and Atlantic Railway. Labrie’s lawyer, Guy Poupart, argued his client had a limited role in the tragedy. He also played up the testimony of several witnesses who described him as competent and reliable and someone they trusted. As well, he noted that a good portion of the Crown’s case did not involve Labrie. MONTREAL — The bankrupt railway at the centre of the Lac-Megantic train explosion as well, as several of its former employees, settled with federal prosecutors on Monday and were ordered to pay fines totalling $1.25 million, while one ex-railway worker was given a conditional jail term. MONTREAL — The bankrupt railway at the centre of the 2013 Lac-Megantic tragedy will not have to stand trial for criminal negligence causing the death of 47 people, Crown officials in Quebec said Tuesday. After three ex-railway employees facing the same charge were acquitted in January, there was little chance of convicting their former employer, Montreal Maine and Atlantic Railway, said Crown spokesman Robert Benoit. An unattended MMA-owned train carrying crude oil rolled down an incline before coming off the tracks in Lac-Megantic on July 6, 2013, exploded into a massive ball of fire and consumed much of the downtown core, killing the 47 people. MMA currently exists as a post-bankruptcy corporate entity with no money of its own and with no physical or operational assets. The defunct railway wasn’t even represented by lawyers during the criminal negligence proceedings. Even if prosecutors had somehow obtained a guilty verdict, Benoit said the next steps would have been unclear. Before the tragedy, MMA existed as two companies, one based in the United States and the other in Canada. The derailment sparked legal claims against MMA that forced it into bankruptcy proceedings on both sides of the border. Attorney Robert Keach, the court-appointed trustee overseeing MMA’s bankruptcy proceedings in United States, told The Canadian Press on Tuesday the railroad has no money of its own. As part of the bankruptcy proceedings in the United States and Canada, several companies tied to the disaster agreed to pay into a fund for victims and creditors of the tragedy, in exchange for legal immunity. Keach said roughly $500 million was collected and most victims have received compensation. The remaining funds are already claimed by creditors and are being distributed by Keach and a Canadian trustee overseeing MMA’s bankruptcy proceedings in Canada. Any conviction would have been against an entity that exists solely on paper “and doesn’t have any money that isn’t otherwise already claimed,” he said. In January, a jury acquitted ex-MMA employees Richard Labrie, Tom Harding and Jean Demaitre of criminal negligence causing the death of 47 people. A month later, MMA and six of its former employees settled with federal prosecutors and were ordered to pay fines totalling $1.25 million, while one ex-railway worker was given a conditional jail term. As of early that month, the company had paid only $400,000 — an amount set aside during bankruptcy proceedings for the U.S. branch of the company. A lawyer with the Public Prosecution Service of Canada said at the time the financial status of MMA was “precarious” and that it wasn’t clear how the court would collect the outstanding money. Meanwhile, Lac-Megantic’s current mayor said in an interview Tuesday she was “stunned” by the Crown’s decision to abandon proceedings against MMA. “Companies need to be held accountable,” Julie Morin said. “And we need to ensure they follow the rules and that their employees are properly trained. All the benefits of being a person and none of the liabilities.